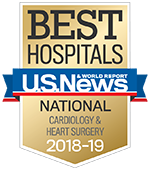 The University of Michigan Cardiovascular Center brings together highly skilled doctors, scientists, nurses, pharmacists, allied health professionals, staff and clinical researchers—all with a commitment to providing the most comprehensive heart and vascular care to each and every patient. To find a cardiovascular physician, visit our Find a Physician page. Visit our Experienced Leadership page to learn more about the Frankel Cardiovascular Center directors or the National Advisory Board page to learn about the 34-member advisory board.